3.44% of India's people live in Kerala. At 819 persons per km², its land is three times as densely settled as the rest of India. Past religions that were prominent in Kerala were Dravidian, Jainism (ended at 8th century), and Buddhism . The oldest church in India is found in Palayoor, which was constructed in A.D. 52 by St. Thomas. The Hindu, Christian and Muslim people are considered peaceful and live as good neighbors. 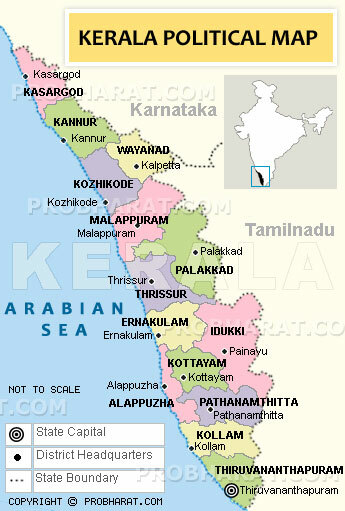 Malayalam (/malayALam/)- main language of of Kerala & the Lakshadweep Islands (Laccadives) (west coast of India). Malayalis (speakers of Malayalam) are almost totally literate. 4 % of the population of India speak Malayalam and 96% of the population of Kerala speak it (29.01 million in 1991). Malayalam ranks 8 among the 15 major languages of India. The great majority of residents of Kerala are Malayalis, but there are many smaller ethnic groups including Tuluvas, Tamils, Kannadigas and Konkanis.